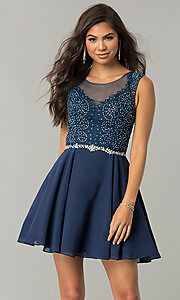 A youthful style, this short chiffon homecoming dress has eye-catching appeal for hoco 2019. Sparkling rhinestones swirl across gleaming lace applique on the sheer-illusion bodice of this radiant party dress. The feminine lace transitions to the sheer-mesh back in a scalloped design that beautifully frames the oval cut-out detail. Crowned at the natural waistline with iridescent gemstones, the figure-flattering short a-line skirt flares away from the hips providing a lovely silhouette. Under $150, this short chiffon homecoming dress has all the dazzle you could want for your semi-formal event without stretching your budget. 30" Hollow to Hem 27"